Mahjong Gate – game rules. 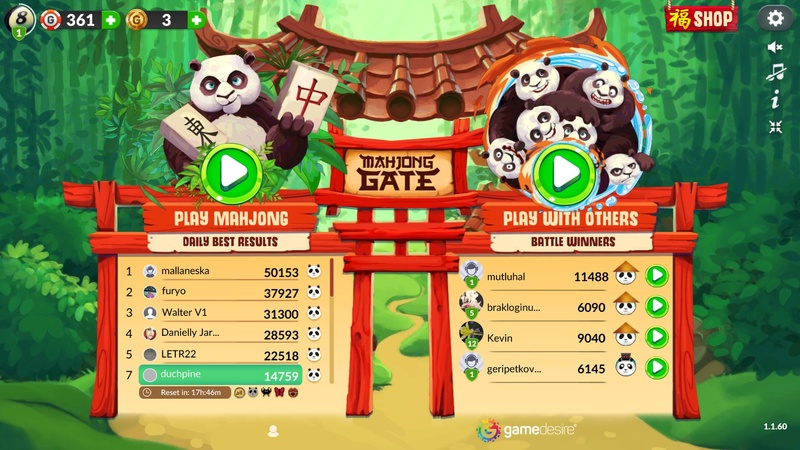 User interface – see how to play Mahjong Gate on GameDesire! 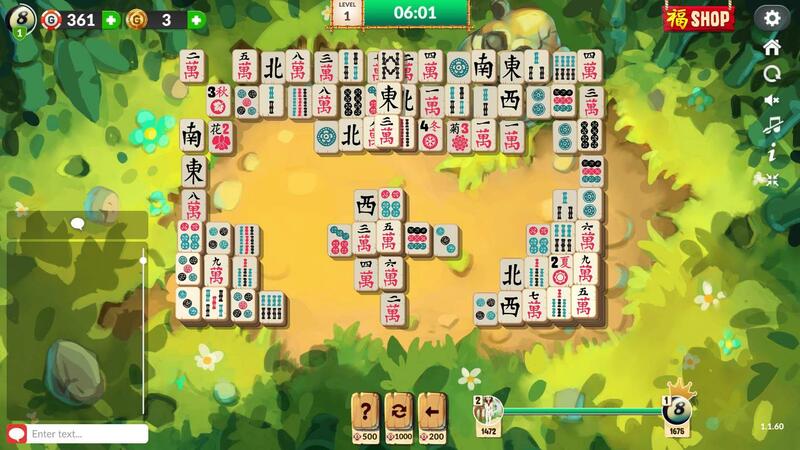 Try your hand at the magical world of Mahjong! The object of the game is to gather the highest score by removing pairs of tiles with identical symbols. You can only remove tiles which are not blocked, i.e. no other tile is placed directly above, to the right or to the left of them. The game ends when all tiles have been removed. 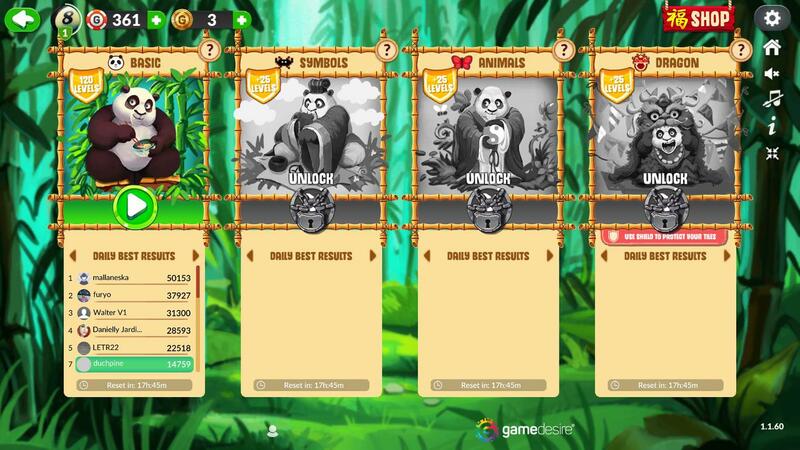 In the top right corner of the screen, there are three icons: "My Profile" which open window with achievements and statistics from specific mode. Also, you can see two more icons: "Gamechips" and "Gift Points", which redirects you to the payment section. In the top left corner, you can find a "Shop" icon, which gives you access to buy different backgrounds, titles or symbols for Gift Points. Fast by "Shop" icon, you can find "Gear" symbol which opens the game options. The middle part of the window is occupied by game modes – "Play Mahjong" and "Play with others". In this variant, four modes are available: Basic, Symbols, Animals and Dragon. Every mode has different difficulty level. The “Dragon” mode trigger Shield power which helps you defend from attacks. The upper part of screen is similar to the previously present window. However, there is the clock in the middle which counts time of the game and information about game level. The central area of the window is a table filled with tiles, and it is where the proper game takes place. In the lower part of screen, you can find chat window and function titles with: Hint, Shuffle, Back and Pause. Closer to right corner information about scored point and Leader score are presented. In this mode you compete against other players. The winner is the person who scores the most points. 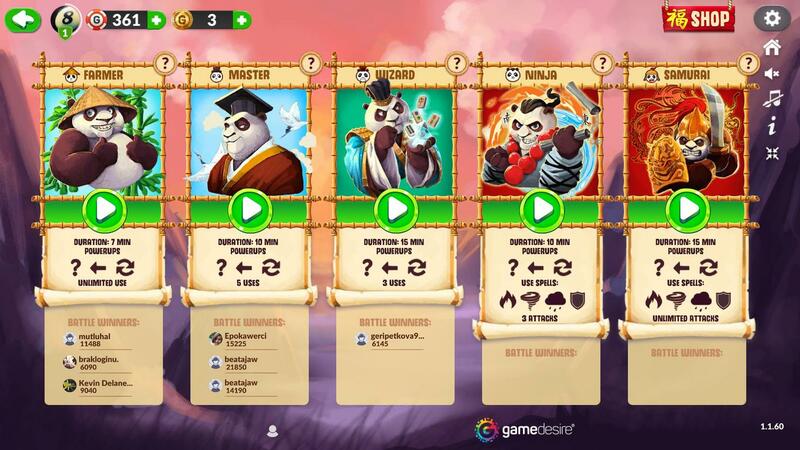 Available modes include: Farmer, Master, Wizard, Ninja and Samurai, all of which vary in time limit, limit of specific powers and number of available spells. The layout of the game window is very similar to the one in ‘Play Mahjong’ mode. In the lower part of screen, you can find chat window and function titles with: Hint, Shuffle, Back and Pause. Additionally, in the “Ninja” and “Samurai” modes you can use: Shield, Fire, Wind and Rain. On the right side, there is progression bar which tells you who is leading in the current game and warns you about coming attacks. Every win and premium place gives you XP points. The amount of XP depends on the outcome of the game as well as on the number of competitors.